I know, I know, I just gave you a whole post on grilled sandwiches but since we just celebrated St. Patrick's day and corned beef was a pretty good deal, I couldn't help but share this recipe. 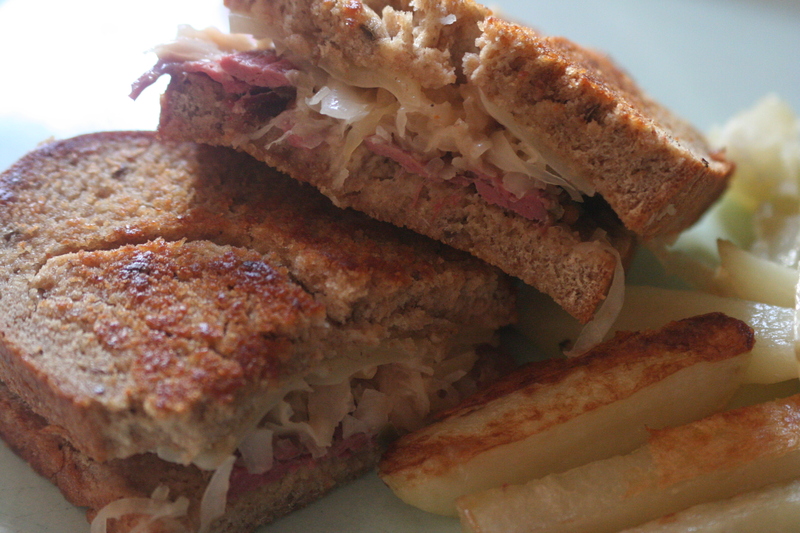 We grew up enjoying reubens - my mom made her rye bread from scratch and we couldn't get enough of the sauerkraut, swiss, and corned beef combo. It has even been a birthday favorite! I made my rye bread from scratch for these but we won't talk about that since I was not very happy with it. And perhaps it should be noted that I am mostly German - I was born liking sauerkraut. Butter the outside of the bread and layer meat, saurkraut, dressing, and cheese. Grill over medium high heat until golden and cheese is melted. *I cooked the corned beef on high for 4-5 hours in my crockpot (until tender) with the seasoning packet and half a can of Guinness. Delicious! We also regularly enjoyed oven fries growing up. They are quick and easy and so much healthier than the fried version. You can also make them with sweet potatoes which I LOVE! Peel and cut potatoes into desired size and shape (I cut mine into long skinny fries). Toss with olive oil, salt, and pepper. Bake at 450 degrees for 20-30 minutes or until tender. That looks SO delicious! We may have to have this on the menu this week. I love sauerkraut, and Jack eats it by the bowlful. I made my own sauerkraut this fall and it's surprisingly tasty - kind of milder than store bought, but also fresher tasting. I used the recipe from Nourishing Traditions.